One of the greatest and most respected artists and thinkers in history was Leonardo Da Vinci. His name is so well known that there is so much stuff on him that it’s dizzying. One of the most recent examples is the “History Channel” documentary “Inside the Mind of Leonardo Da Vinci” starring Peter Capaldi as Leonardo. As far as documentaries go, this is one of the more interesting and enjoyable ones. 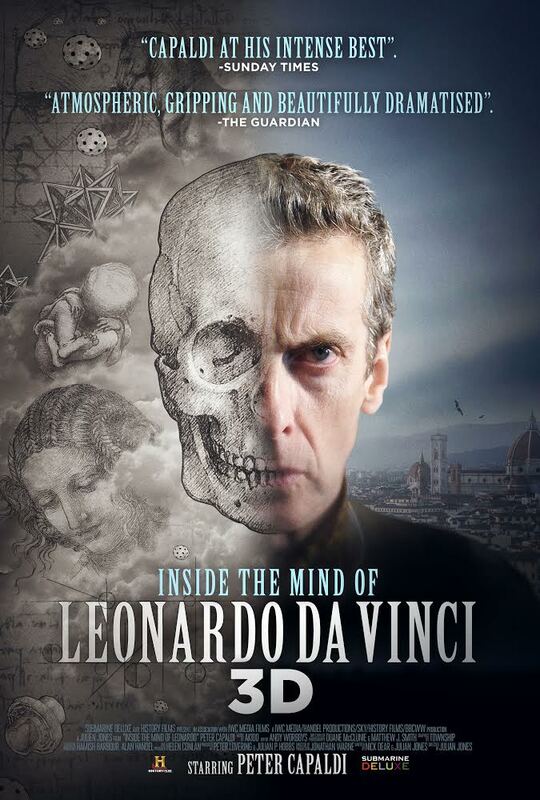 The documentary focuses on Leonardo’s private journals as told and acted by Capaldi. The contents of these journals range from his opinions on art, life, spirituality and science. One thing that this documentary does differently than other documentaries is instead of focusing on experts and actors doing certain parts, it’s just one person getting into a character and using visuals. In a way this makes the documentary a lot more personal than with many people. It also feels like the actor is talking directly to you seeing as how these are journal entrees. The best part of the documentary is Capaldi himself. He brings his A game by not just acting like Leonardo but becoming him, channeling him if you may. He brings so much ferocity, passion and vigor into the role that you are left hanging onto every word he says. Not to mention his physical acting, though limited, is as lively as his vocal acting. He makes the documentary. Visually, the documentary is stunning. Using images from Florence, Milan, the Tuscan countryside and Renaissance interiors the documentary brings Leonardo’s world to life. It also uses some CGI for certain parts of the film. The CGI is well done well in some parts, although there are times where you don’t notice it. One of the things the film has is that it is shot in 3D. 3D can either be done well like in “Avatar” or it can be a gimmicky “look, things are in your face” bore fest. Thankfully, it’s the “Avatar” route where it’s used more as a way to make the audience feel like they are in the movie. It makes the scenes look real and not on a one dimensional canvas. Of course, there are times when you don’t notice the 3D. Some of the street shots don’t pop out at you, nor does the scene on the bus. It may be in first person, but if feels cheap. There are also parts where we see Leonardo’s journal. The film tries to make it look nice in 3D, but it’s not noticeable. There is also the part with the falcon. The first time you see it it’s impressive; the second and third times the effect is gone. “Inside the Mind of Leonardo Da Vinci” is a fascinating and original documentary about the great Renaissance painter. It is well shot, has some impressive visuals and Peter Capaldi is a joy to watch and listen to. The best way to experience this film in is 3D. If that’s impossible, it will still fascinate and amaze you.